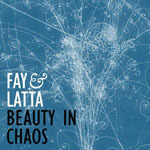 Share the post "Album review: FAY & LATTA – Beauty In Chaos"
Avid GRTR! browsers may have spotted our 2009 review of Brit female fronted heavy rockers Exoterik’s ‘Butterfly In Your Hand’ – an album we saw as throwing down a gauntlet to the Evanescence pop / rock dynasty. We noted then, that the ace in the Exoterik pack was front-woman Anneka Latta. Well, it turns out that she – and axe wielding front man Tom Fay - have acoustic soft rock alter egos. The one man, one woman acoustic/vocal combos seldom leads to mega stardom, but down the decades it’s one that’s produced some absolute gems of albums. J.J in the early 1990s AloneMe in the 2000′s – quite stunning female vocal performances over the most intimate of accompaniments. Sadly neither went on to greater things, but for a brief period in time, and still, they shone like a supernova. Like Doctor Who, the latest incarnation of this phenomenon comes from the most unlikely of sources – Keighley, Yorkshire duo Tom Fay & Anneka Latta. Their self-released debut album ‘The View From Here’ was released in 2011, but the follow-up Beauty In Chaos takes them to another level with ELO violinist Mik Kaminski adding some extra poignancy. Paul Burns takes on bass and programming duties with Latta playing piano and tin whistles, and Fay acoustic and electric guitars. And such is the strength of the songs, playing and achingly beautiful vocal performance that Kaminski is merely the cherry on the top of an already perfectly baked and iced cake. This entry was posted in ALBUM REVIEWS, ALBUM REVIEWS (Mobile), All Posts and tagged acoustic, album, Anneka Latta, Beauty In Chaos, electro, Exoterik, Fay & Latta, review, rock, singer, songwriter. Bookmark the permalink.